These handmade wool booties turn little feet into prehistoric beasts. A pair of fearsome, three-horned beasts stomps across the prehistoric playroom in search of a snack. Actually, they're just old softies at heart. 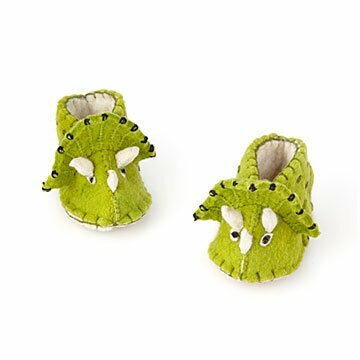 Handcrafted in small batches by artisans in Kyrgyzstan, these booties are made from natural wool which is dyed, spun, and felted before being cut and stitched with adorable dino details. As a baby shower gift, they'll give that T-Rex layette a run for its money. Designed by Gulnara Kydyrmyshova. Handmade in Kyrgyzstan. So happy to find these adorable little slippers. Our daughter is having our first grandchild and I can't wait for the little one to be able to fit into these! Our daughter has always loved dinosaurs and chose it as her baby theme. The fact that they are made from natural materials was definitely a selling point- baby's can be so sensitive to materials- our daughter never outgrew hers, so it was very important to me that they are made with cotton and wool. They're perfect and adorable!!! Bought this for my friend's daughter. Cute but ended up being too small, so I gave it to someone else. Both really liked the design. These little booties are beyond precious, gorgeous details and very soft. Can't wait to see my grandson wear them. I love love love the look of these little booties, but unfortunately, for the life of me, I can't get them to stay on my infants feet. Not only will these keep the baby's feet warm, they will also give him something cute to look at and babble to! Love them. This is the cutest little pair of booties I've ever seen for a little one!